So, since I have two high schoolers this year (how did that happen?!) 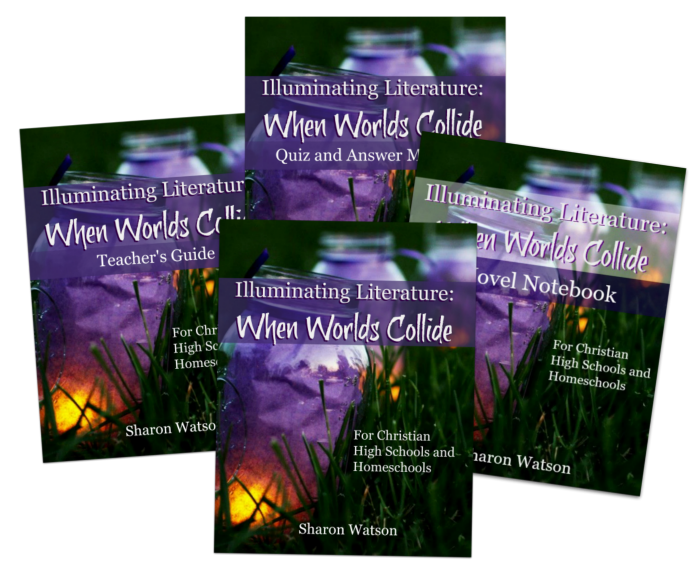 I jumped at the chance to review Illuminating Literature: When Worlds Collide from Writing With Sharon Watson. We’ve used and been impressed with her writing programs in the past, so I was eager to take a look at her literature course. I received the entire Illuminating Literature package, consisting of the Student Book, Teacher’s Guide, Quiz and Answer Manual, and the downloadable Novel Notebook, plus the first two novels used in the lessons (Pudd’nhead Wilson by Mark Twain and The War of the Worlds by H.G. Wells). My initial plan was to use this for Kyle this fall for ninth grade, but I’ve ended up deciding to use something different for him this year (which I’ll be writing about more in the near future), and using this for Kaitlyn for her senior year. It was originally developed from reading groups the author taught that met once a month, and that’s the rough plan we’re following: one book a month. The backbone of the course is the Student Book. There are nine chapters – an introductory one, and one for each book. Each chapter is divided into several lessons. There is a “Suggested Reading and Homework Plan” for each chapter that divides the lessons, reading, and assignments into four weeks. This is the schedule we’ve been roughly following so far, and I think it’s going to work well. Kaitlyn really appreciates the conversational tone, just as she did when she used Jump In and Writing Fiction in High School by the same author. The text is written to the student, so she’s able to work through this independently, following the schedule outlined for each chapter. There are some questions and exercises in the text, and as she goes along, she also fills out the pages in the downloadable Novel Notebook. She answers questions, collects favorite passages, and draws conclusions about what she’s reading in it. Once she finishes each book, she will take several quizzes on it that are included in the Quiz and Answer Manual, and are also available to take online (we’re just wrapping up the first book, so we haven’t done this yet). The Teacher’s Guide has a lot of information to help teach this in a co-op or group setting, but so far I haven’t found it crucial for using with a single student in a non-classroom situation. It has an answer key for all the quizzes, but if they’re taken online, they’re automatically graded so you won’t need that. Some of the activities and discussion suggestions may come in handy for one on one discussion at some point, so it’s nice to have still. So far, I think this is going to be a great fit for Kaitlyn’s busy senior year! It’s thorough without a huge volume of reading and assignments. For example, one high school literature program we used in the past had 28 – yes, 28! – books included! Kaitlyn is a voracious reader, but her schedule just doesn’t allow for the sheer amount of time required for that kind of reading in addition to her other subjects and extracurriculars! One book a month is a reasonable pace and allows us to not feel like we’re rushing through, and there’s nice variety in the book selections. I really like the philosophy behind the course and the way a Christian worldview is integrated into it. Besides covering all the usual areas of literary analysis: foreshadowing, protagonist and antagonist, allusion, genre, voice, etc., there is the idea that all these books, rather than being treated as “sacred” classics, should be seen as written by flawed humans who struggled with, and even gave in to, their sin natures. The authors may or may not have been Christians, and even if their stories don’t agree with the truths written in the Bible, they can still reflect redeeming truth and be worth reading. I’ve been impressed with Sharon Watson’s writing programs, and this literature course continues that tradition. If you’re looking for a substantive high school literature course that’s not overly time consuming, isn’t afraid to tackle tough worldview issues, and is student directed, Illuminating Literature: When Worlds Collide is worth considering! You can see samples here. Hi, Kara! Congratulations on having a senior in your homeschool. I know the students get all the glory upon graduation, but I think we homeschool moms can pat ourselves on the back a little, too! Thank you for your review of Illuminating Literature. It’s not easy wading through all the courses out there; I think your clear review will help other moms make informed decisions. Sharon Watson recently posted…I Believe . . . Thanks so much, Sharon! It’s hard to believe this year is upon us! We’ve thoroughly enjoyed your writing courses over the years, and I know we’re going to enjoy this literature course too! Sharon Watson recently posted…If You Could Not Speak for 15 Years, What Would Your First Words Be?